I wrote this article about birth art some time ago and it has appeared in some form or another in both the CAPPA Quarterly and in the Friends of Missouri Midwives newsletter. Since I posted yesterday about polymer clay birth art figures, I felt like sharing this article today! I learned about creating birth art during my first pregnancy in 2003 when I read Pam England’s amazing book, Birthing from Within. Seeing paintings creating by pregnant women, mothers, and fathers was inspirational for me. I was also moved by reading the accompanying explanations of how the art process had helped people on their birth journeys, or on paths to healing from traumatic experiences with past births. In the book, Ms. England primarily discusses the use of journaling, painting/drawing, or sculpting. Though I am an avid journal keeper, I did not find that medium vibrant or visual enough to express the hidden birth wisdom I sensed faintly at the edges of my consciousness, waiting to be given form. Birth art allows you to tap into your “right brain” consciousness and express unexplored gifts, primal wisdom, or release hidden fears. Creating birth art can help you explore your feelings, memories, beliefs, and perceptions surrounding birth outside of the confines of the spoken or written word. 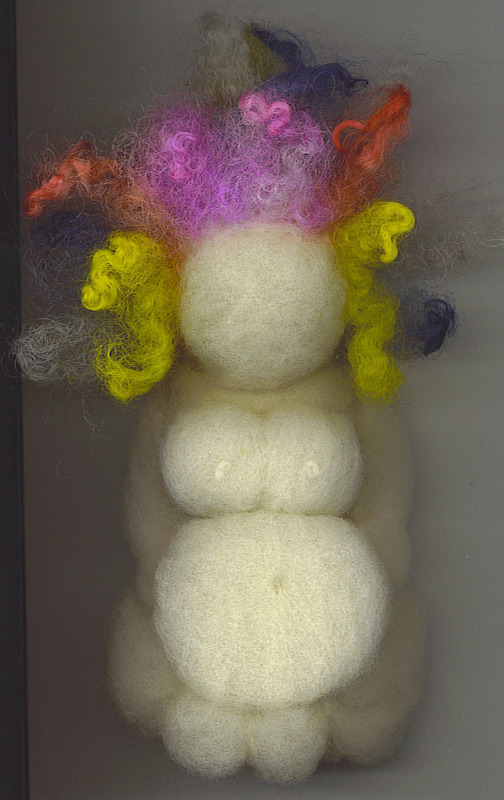 During this time, I had also been experimenting with the craft of needle felting. 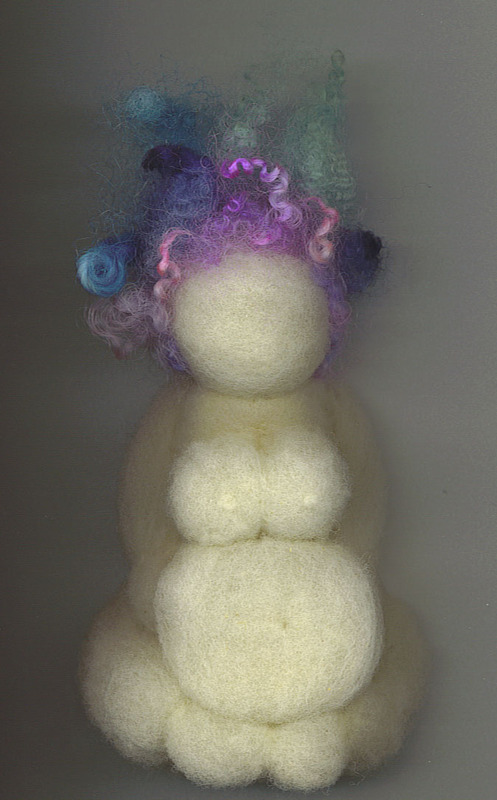 Needle felting involves using 100% wool fiber, a single felting needle, and your imagination! Needle felting is a dry felting process in which washed and carded wool fleece is sculpted into shape using only a special barbed needle. I decided I had found the perfect medium to express my birth art. I had envisioned creating a Venus of Wilendorf style goddess sculpture. My first attempts left me feeling dissatisfied. 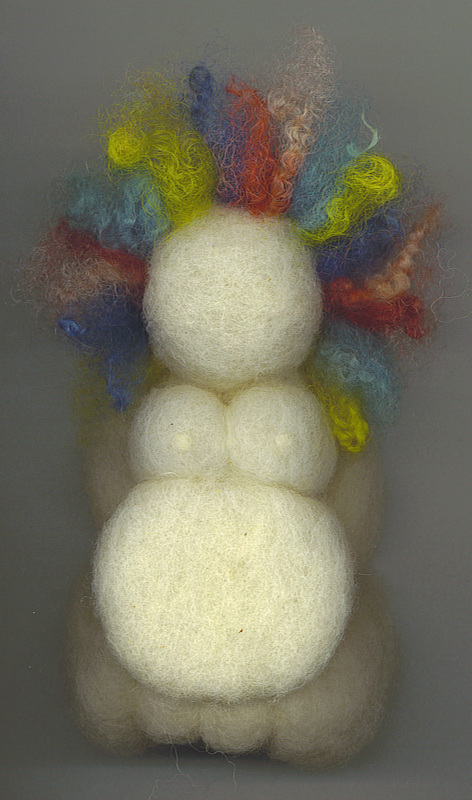 I had created the form of a pregnant woman with white wool and then layered colors over it (the effect was cluttered and disorienting—not the inner wisdom I was seeking to explore). I also gave them faces that seemed unfortunately more haunting than wise. Finally, I created a lushly full figured pregnant woman in white wool in a seated position (my previous efforts were standing) and decided to leave her white and without facial features. I gave her wild, colorful hair in colors representing the four elements. Finally, I felt my vision being manifest! My only concern was how the eye was drawn to her head/hair. One of my fears surrounding birth was that I would be too “in my head” to get into the rhythm of the birth process. I worried that this fear was given visual form in my goddess sculpture—her “energy” was concentrated in her wild, woolly hair, not in her ripe body where I thought it “should” be. Only after I gave birth to my son, did I fully realize what my exuberant goddess was trying to tell me. Her hair and the colors in it were symbolic of the elemental forces and intuitive knowledge that each birthing woman possesses. I had been concerned about being “in my head” with “book learning.” After giving birth, I recognized the intuitive, natural, wild wisdom that I do carry in both my mind and my body. How fantastic! I made one in between my first and second daughters! She kind of has Marge Simpson hair, but I had a lot of fun making her. We loaded her up with Reiki, too! Oh my! I LOVE yours! She’s beautiful! Thanks for commenting and sharing your picture.